I posted several weeks ago about attending the Atlanta Fashion Bloggers Crawl, which is where I met Sarah of Marie Oliver. I was drawn to the collection because the bright colors and fun designs of the Marie Oliver line caught my eye. I tried on the Signature Oliver Drape Cardi in Rainbow Fan Spring while I was there and fell in love, and am thrilled to highlight it in today’s Fashion Friday post. This cardi is gorgeous. The colors make me happy and it pairs nicely with a tank and white jeans. It is elegant, yet modern, and made of silk which makes it feel so luxurious. Make sure you check out Marie Oliver’s whole line which is full of colors and patterns that are sure to make you smile. Each classy piece is made to be elegant yet easy and that clearly shows through the line. I am swooning over some of the gorgeous tops and dresses that are perfect for summertime. Each piece is one that could be dressed up or down to be worn both day and night, and are inspired by luxury interior design and cultural experiences. Have a great weekend everyone! We are leaving for our cruise Sunday and not returning until the next Sunday, May 3, which is also my birthday! I’ll be taking a blogging break during this time but when I return there is a whole week filled with fun stuff (read: giveaways galore) so stay tuned! I love the bright colors as well. I am going to check out her collection. I am excited to see what she has to offer. What fun and colorful pieces for Spring. Love how your little one isn't too sure about that frozen treat…she will figure out how awesome it is soon! Love your outfit, I hope this coming weekend you will enjoy your cruise, and advance Happy Birthday, your daughter is adorable I want to give her a warm hug and kisses. The colors are refreshing and the length is just right. I love it very much! 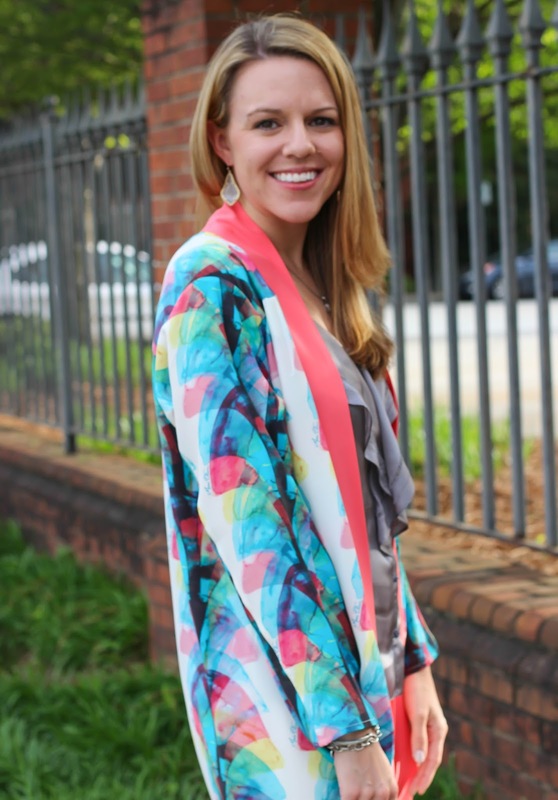 I love that jacket–it could be worn with almost everything and it is so bright and cheerful. I love the color and it looks great on you! Thast is a great piece for Spring, it lightens up your moood and it looks comfortable.